Law makers are threatening to shut down Vancouver's controversial safe injection clinic. The clinic is getting supported by somewhat improbable allies - retired police officers. Vancouver's controversial "Insite" safe injection program for heroin users is scheduled to close in a month. Lobbyists on both sides of the issue are working on health Minster Tony Clement, the man who will decide whether to grant the clinic another closure exemption. Insite provides a secure place for I.V. 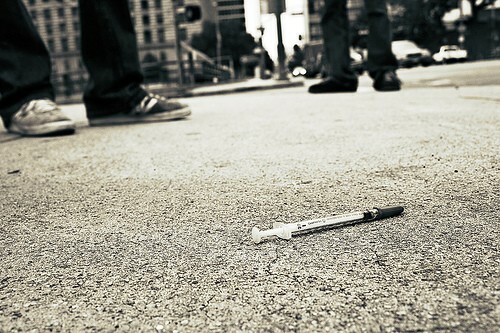 drug users to inject drugs under medical supervision, and free from prosecution. In support of the clinic, three retired police officers, one who traveled from his home in Australia, assembled at an Ottawa news conference to publicize their opinions on the issue. The group of ex-cops represents an organization called Law Enforcement Against Prohibition, which feels that the societal problems caused by drugs are directly related to their illicit nature. 28 year Vancouver Police veteran, Tony Brown explained, "We all agree that most of society's problems with illegal substances are not caused by those substances but rather by the over-enforcement of our drug laws through the war on drugs,"
Tom Loyd, a former Cambridge police officer said that the injection clinic was saving lives, he said, "If it's shut, people will be condemned to certain death. That's the reality." Chris Payne, a retired police officer who traveled from Australia for the event said that, "law enforcement has put a lot of people in jail but I doubt it has done much for the addicts themselves." The three retired police officers are joined in support by the mayor of Vancouver and by the city's police chief. Both of whom report that the clinic has not increased crime or abuse, and that it has helped people get into treatment. Not everyone agrees though. Ron Taverner, a Toronto Police Superintendent thinks that enforcement has to go "hand in hand" with prevention and treatment. He says, "The legalization of safe injection suites is not the answer." The Insite clinic has proven a divisive and controversial program since its inception, and the controversy has grown far beyond the Vancouver Neighborhood it serves – at least for now.